Finishing off a project with a stamp is just the thing, and the perfect way to end our STAMPtember celebration! I (May) just needed a sentiment stamp to finish my card. Armed with the new Dina Wakley stamps, I just can’t quit stamping up a storm!! When I got caught not sure where (or what!) to do for a sentiment or how to finish off my card I thought of this week’s challenge. Of course – a stamp was just what I needed. Emma embraced her romantic side to create a card, inspired by Jean-Jacques Rousseau’s quote. 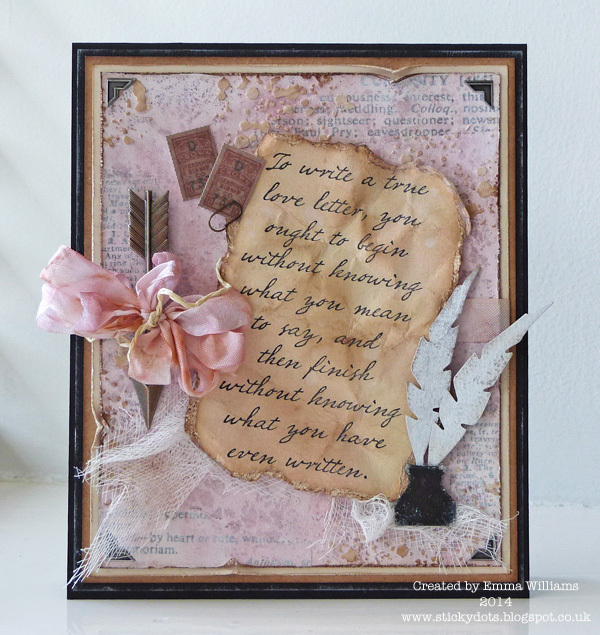 Ever since I first bought it, I’ve been waiting to use this wonderful Love Letter stamp from Tim Holtz for quite a while and this project became all about creating a card and using the quote as the perfect finishing touch. To complete the card, I added various Idea-Ology pieces and the Mini Feather & Inkwell die cut, against a background of Victorian Velvet Distress Paints and stencilled texture. As soon as I saw the lovely grey floral in the Cosmo Cricket Vellumptuous Paper Pad, I knew what I wanted to do! 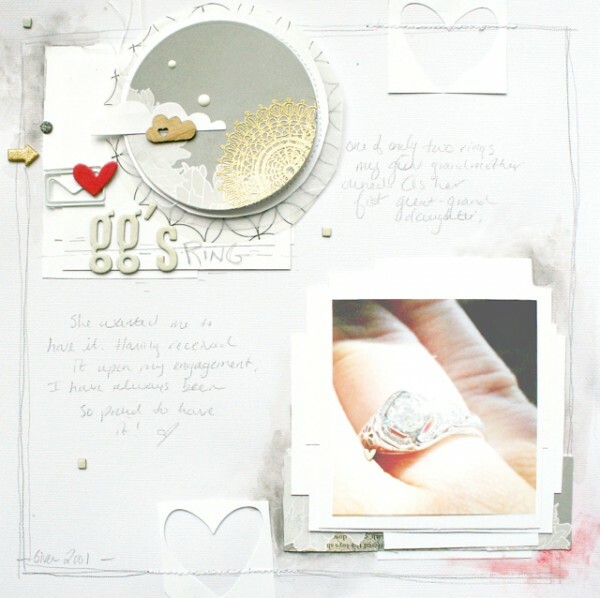 Layering circles of those lovely papers created some beautiful custom embellishments. Then, Stamping them with an Inkadinkado Lace Doily using Gold Embossing was the perfect finishing touch! I just love what this adds to my layout about my Great Grandmother’s Ring. Anna-Karin made an artsy little mini canvas this week. I love using background stamps to add a finishing touch to a project, such as the cracks stamp here. 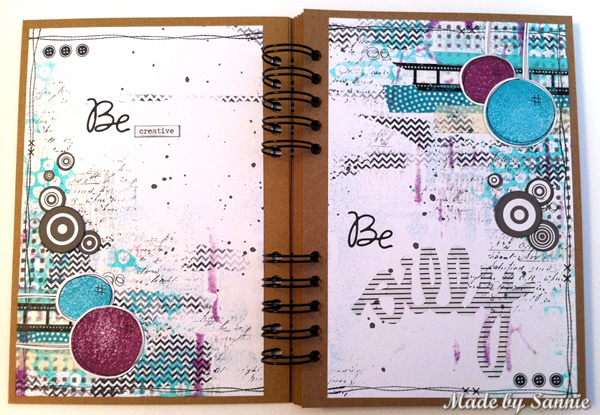 Randomly stamped background stamps can give just the perfect amount of texture to a background. 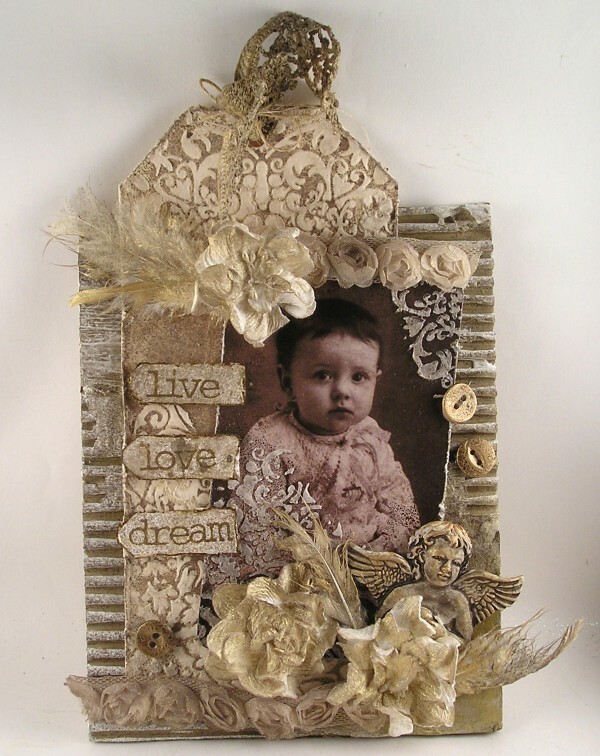 The canvas was also stamped with a sentiment and face stamp by Tim Holtz. In the background you can spot some stencilling. I embossed the edges with Ranger’s Liquid Platinum embossing powder. Michelle loves creating Autumn leaves! Ever since I was a little girl, I have enjoyed creating and coloring Autumn leaves from paper. 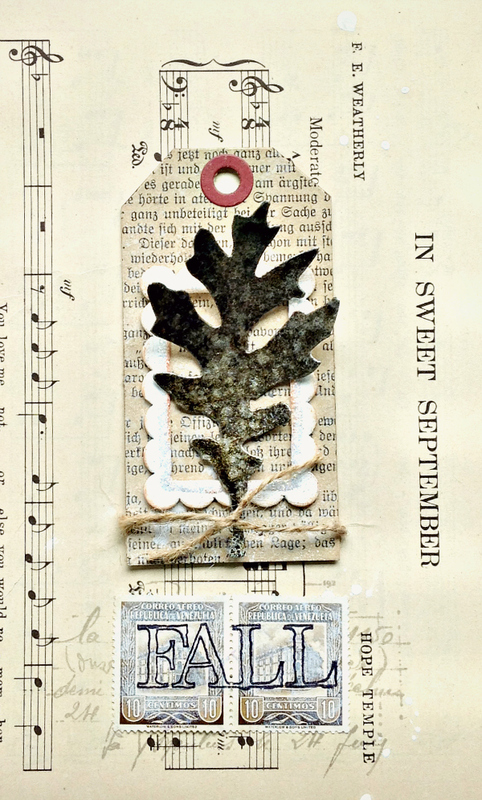 For this art journal page, I chose the unusual color of Distress Paint in Pewter for my Tattered Leaf. As a finishing touch, the word “Fall” was stamped directly on vintage postage stamps. I love to play in my art journal and I was a bit silly making these pages. I tried to make a print with the Simon Says Stamp Scrambled Letters stencil and Blackberry Violet paint. Not as visible as I had hoped. I used Peacock Feathers and the Distress Spritzer instead. That makes for such a subtle background. A perfect start to build up these finished pages. As for the finishing touch I love to add those Stitches stamps from Bo Bunny around the edges! 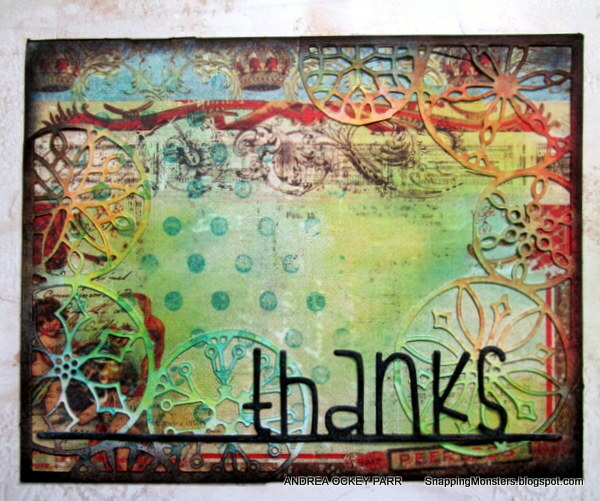 Suzz started a project with lots of different elements but saved her stamping for the very last touch. I started this process with a look around my crafty surface. I saw some new Ranger Manila Craft Tags and some Wendy Vecchi Embossing Paste which had me pulling out the beautiful Memory Box Lanthenay Stencil. After that I was stencilling up different surfaces and they started to overlap and blend into a project. I love when the creative process leads you to an idea which turns into something beautiful. 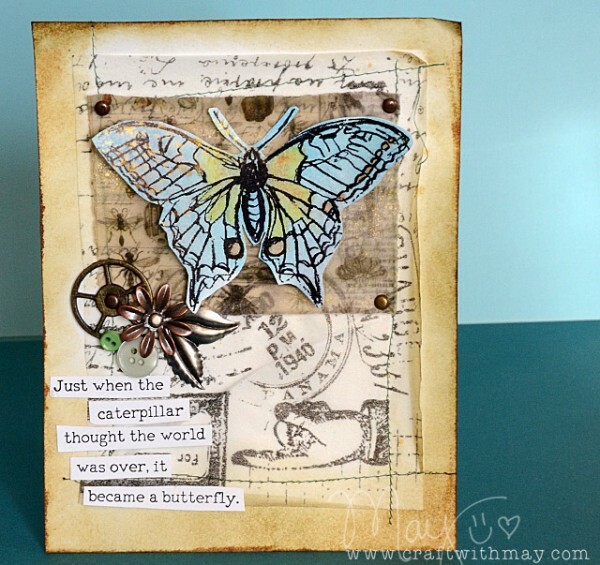 Meihsia was inspired to create a mixed media canvas with some stamping as a final touch. 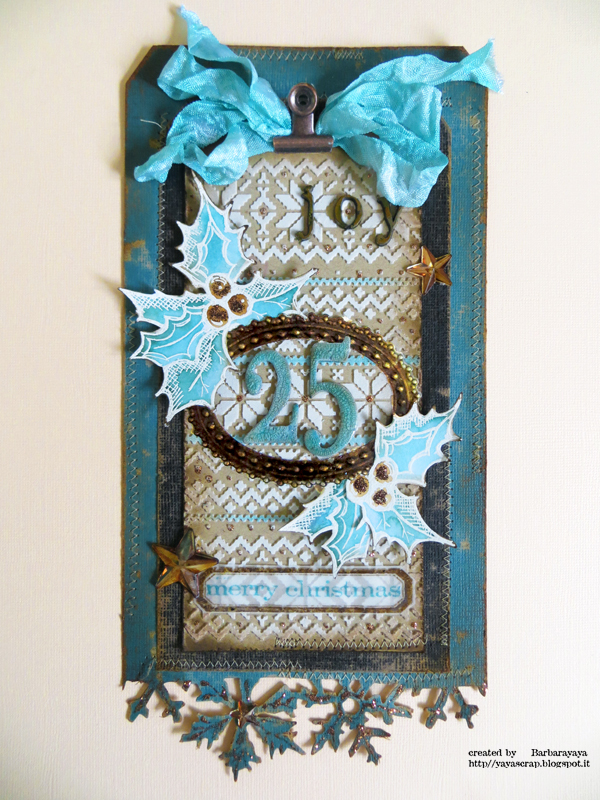 To create a mixed media canvas with a different color scheme this week, I tried Tim Holtz Distress Paint Ever Green Bough. After attaching some Tim Holtz and Prima Flowers embellishments, I stamped the Tim Holtz Cling Rubber Stamps Cracks & Specks as the final touch and I love the beautiful crackled effect. Andrea likes to finish things off with a handful of polka dots. If there’s one thing I’ve learned about myself and my style, it’s that I’m a polka dot addict. Almost subconsciously, my hands will reach for polka dot paper, polka dot stamps, or polka dot Washi tape. It seems to be one of the constants in my phase-filled artistic style. Imagine my excitement when I came across this fabulous polka dot brayer, which I used on my card, along with the great new Prima paper line titled Cigar Box Secrets and the handy-dandy Simon Says Stamp Thanks on a Line die. Mona had fun creating a holiday inspired canvas. One of the many things I love about the holidays are the fun shaped ornaments. To create a holiday inspired canvas, I added added Texture Paste along with the Harlequin stencil then topped off the canvas with a trio of heat embossed ornaments. Barbara decided to create a jumbo tag which can become a home décor and hanging. As always, Simon Says Stamp is giving away a $50 gift voucher that will go to a random entry chosen by random generator. To qualify all you need to do is create a new project that ties in (in any way!) with our theme and post it, along with a link back to this challenge, and add a link here. This challenge will end at 11:59pm on Sunday October 5th Eastern time. We will also be choosing some of our entries to put in the spotlight – a special honor where we talk about why we loved that entry in particular and award a special badge too! For the full rules, read the “challenge rules” posted in the side-bar here on our blog. Fabulous DT inspiration as always! Thanks for another fun challenge. Awesome inspiration from the DT…thank you! Thanks for the always great challenge themes and inspirations! Love the link up concept!! Just received my recent order – fast shipping! I love the variety of finishing touches in the DT member’s projects. Blessings!